Cheswicke Farm is in an extreme seller's market. However, the sales price to list price ratio is low when compared to the 99.6% Franklin homes priced between $350K to $450K show. The average days on the market of 79 are high compared to 40 days for this price range. Homes priced under $400K are in a better position to sell quickly. While the housing market is quite good right now, buyers have become more particular than ever. A recent National Association of REALTORS® survey revealed 92% of buyers begin their home search on the internet. Properties heavily marketed there have a greater opportunity to be found by home buyers. This goes way beyond just syndicating your home from the MLS to national portal websites. Professional photography isn't the only requirement. The best way to bring attention to your Cheswicke Farm home is to have an agent who is using the newest technology to get the word out about your home. This includes the use of social media and blogging. 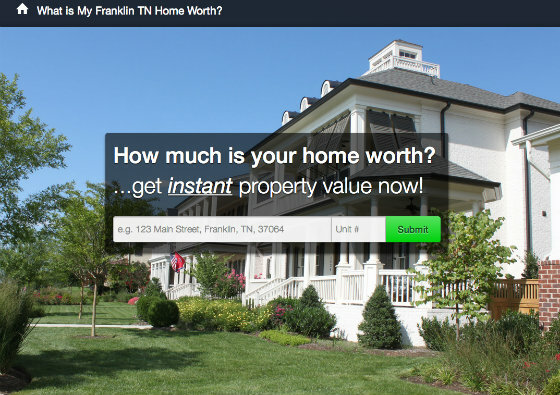 Something not many listing agents in the Franklin housing market are doing. Curious how we do this? When you get ready to sell your Cheswicke Farm home, contact Tammie White of Franklin Homes Realty LLC at (615) 495-0752 and we'd be happy to share how we can do this for you.